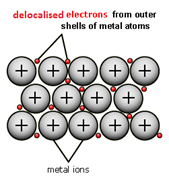 Metallic bonding is the strong electrostatic attraction between positive metal ions and a sea of delocalised electrons. Metals are good conductors because they have delocalised electrons which are free to move. Metals are malleable (can be hammered into shape) because they have layers of ions that can slide over each other.